It's safe to say that this year's Chicago Blackhawks have taken fans from the kiddie coaster to the Kingda Ka coaster with the peaks and lows of this season that still has 35 games remaining. Still, that is plenty of time for a team that is only 6 points out of a playoff spot to make a move. And as subtle as it may seem, this team is making that move. Whether or not there is enough time to make that happen, that is yet to be seen. But, let's take a look what has happened leading to this point. First, there was the wound that still hasn't healed of long-time coach, Joel Quenneville, being relieved of his head coaching duties. Should it have been done? Probably. Ten years is a long tenure for a head coach in any league before stagnation occurs and his words fall upon deaf ears as they do from parent to child. Should it have been done 15 games into the season? No. Quenneville has more than earned respect in the league where it should have either been done at the beginning of the season, or the end of the season to make that move. My guess, is that the quarrels between Quenneville and the now hated, Stan Bowman, had come to a bursting point, and it was time to make that change. It was a marriage that had it's 'moments' and now it was time to move on. Yes, Bowman should and probably is on the hot seat after the season ends for his job, but as we will see, he hasn't been sitting on his hands since firing Quenneville. When Quenneville was fired, the Blackhawks went through a stretch where they went 3-16-3. You can go back and check. I did it three times to be sure. What a mess. Since then, they have gone 7-4-4. In those last fifteen games, all but one, was against a current playoff team. Some of those games, if a couple of things had gone differently, they could have gone 10-3-2. Not a bad turn around if you think about it. Under first-time NHL head coach, Jeremy Colliton, who turns 34 today (Happy Birthday, Jeremy), they have gone 10-16-6. Nothing to write home about, really. Hell, they started 3-12-2, under him. One has to take into account a coaching change of a totally different system, but still. But let's take a look at a stat that has puzzled Blackhawks fans for years up until a few weeks ago. The power play. The season started with the Blackhawks dead last in the league (11.4%) in the first 35 games of the season. Since then, they have been the hottest power play on ice (36.4%). So why the change? The team is the same...or is it? On November 25th, Stan Bowman became more unliked when he traded fan-favorite, Nick Schmaltz to the Arizona Coyotes, for forwards Brendan Perlini and Dylan Strome. Perlini, has been barely noticeable, if not for a goal in the Winter Classic, (21 GP, 2G, 1A, -13). He will probably split time with the recent arrival of Drake Caggiula. The real reason for the trade was Strome. A line-mate of Alex DeBrincat, while playing for the Erie Otters, in the OHL. Since his arrival, Strome has brought net presence. Something this team has battled to obtain for over ten years (noticeable exceptions over that time, Artem Anisimov Jonathan Toews, Dustin Byfuglien). He's also shown up on the score-sheet. In 23 games with the Blackhawks, he has 14 points (7G, 7A). In 48 games in Arizona, he had just 16 points (6G, 9A). Did I mention he is under contract through the end of next year at a cap hit of $863k, while Schmaltz is up for a new contract and out for the season with an injury? Trade advantage - Chicago (Thanks, Stan). Another reason for the power play surge, is the play of Erik Gustafsson. Yes, his defense is lackluster. Yet, he leads the defensive corp. with 29 points (8G, 21A). Keith is next with 20 (1G, 19A). He has found his nitch and finding Kane on the power play, and in general. 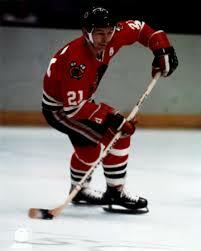 Did I mention 'Gus' spent time in Rockford with Colliton as coach? It looks like he may actually finish a full season up with the NHL squad. Speaking of defense, it has been absolutely horrible. Giving up 34.8 shots a game, and 171 goals allowed (both second worst in the league), the tandem of Corey Crawford and Cam Ward, don't stand a chance. Every game, whether win or lose, one of them is always the player of the game for the Blackhawks. Crawford though, may be done for his career, since suffering yet another concussion. Enter Collin Delia. Delia has been nothing but brilliant, minus a few rookie mistakes. His stats (3-1-3, 2.70 .GAA, .932 SV%) are best on the team in all categories. He becomes a restricted free agent at the end of this year, but he can also become the future of the Blackhawks. At just 24 years old, he can be the cog that can replace Crawford if he can't come back from this latest injury. The future is bright in goal for the Blackhawks. As far as that defense is concerned, Brent Seabrook and Duncan Keith are not the defensemen they used to be. 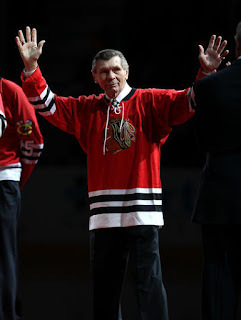 Nor should they be, being #2 (1050 GP) and #3 (1042 GP) respectfully on the All-Time games played list for the Blackhawks, passing Bobby Hull earlier in the year (1036 GP). 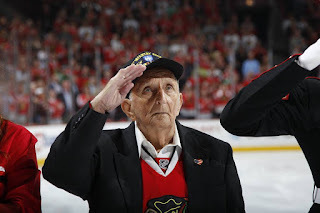 Or Stan Bowman, being who he is, may go find one, if not two solid defensemen in free agency to come in to split top four responsibilities with Keith and Seabrook. They have played decent, but their lack of speed shows. They both have no-trade clauses, so they are not going anywhere. Keep them, just reduce their minutes to where they are more effective. This team is finding their groove under Colliton, especially on the power play. Alex DeBrincat (5G in last 4GP) and Patrick Kane (3G, 7A, last 5GP), have led the way for a team getting more confident in their play. They are not in the best of places in the standings, but we all know six points is a sneeze away when there are 35 games remaining in a season that seems to have felt like two seasons already. There may be some leg room now as some band-wagon fans may have left the building, but that just makes more room for the rest of us. Let's see what our boys can do the rest of the way and see how far it takes us.